A truck accident on the 210 in early September has taken the life of the driver of the truck. Police reports show that the big rig hit a smaller SUV and though the SUV driver was able to regain control of their car, the truck driver was not as lucky. His truck jackknifed, collided with a tree, and rolled over. While the cause exact cause of the accident is still in question, it appears that there may be cause for a wrongful death claim. Who can be sued in a wrongful death case? The employer of the truck driver. 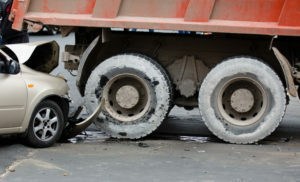 If the truck driver was at fault due to their employer requiring them to work more hours than they are legally allowed, then the employer may be at fault. The employer could also be at fault if they hired a driver who was not properly trained and / or licensed. The insurance company of the truck driver. The entire point of an insurance company is to cover injuries / damages caused in accidents. Even if the policyholder dies in an accident, that policy may still cover damages and injuries. The manufacturer of the truck. If a significant cause of the accident was a defect in the truck itself, then the company that manufactured the truck could potentially be held accountable. Other drivers. In this particular case, the question remains as to why the driver lost control of the vehicle. If a closer examination shows that there were other drivers who caused the accident or contributed to it, then they could be held responsible. Government agencies. Were there dangerous road conditions at the time of the accident? Could those road conditions have been prevented? Were they the result of poor maintenance by the government? For example, were there trees or bushes obscuring the road? If so, then the government may be held accountable. Note that if this is the case, the injured parties should act right away because the timeframe during which they can sue the government is much shorter than the timeframe to sue the general public. Do you believe that you may have grounds for a wrongful death case or other accident injury claim? Then we urge you to contact Law Offices of Michael A. Kahn at (310) 209-1600 for a free legal consultation.